The question then becomes which, if any, of these paints is the right one. I believe the best way to answer that question is by comparing to NOS gauges. And I just happen to have a full set of them that have literally never seen the light of day, meaning they've been kept in a box since they were made. Given that, I think they are as close to the original color as we are likely to find. Here's a shot of all four gauges as well as the paint swatches. (You can click on it to bring it up bigger, but there are close-ups of some of the gauges further down.) But, before we go much further I want to point out that there are differences in the colors of the NOS needles. To my eye there are slight differences in all of them. 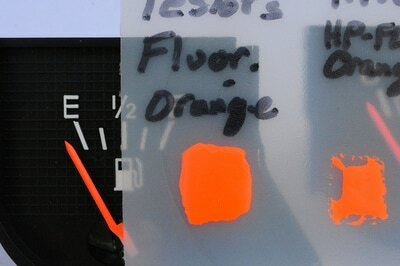 So, here's a close-up of the two gauges whose needles are the furthest apart in color. To me the oil pressure gauge is slightly more orange than the fuel gauge. 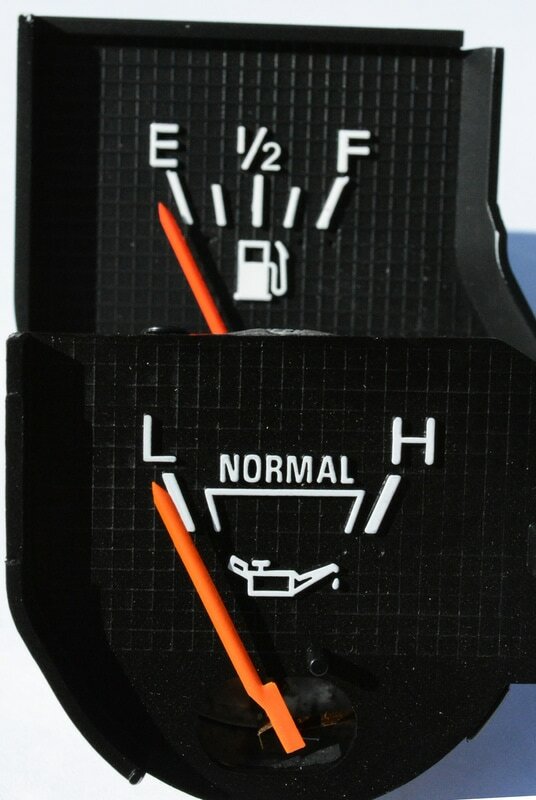 However, the fuel gauge needle is seemingly the closest to the other two gauges, so I used it in the comparisons below. Below are two shots that allow a closer inspection of the needles and colors. In a daylight side-by-side comparison the Testor's paint is the best match, although that may not look the case on a computer screen. And, in daylight the HiPo Red is just too red to match the gauges. Paint Issues: I've used the HiPo paints previously and have found that it takes about three coats of paint to give complete coverage. However, on the larger needles, like the speedometer and tachometer, each successive coat gets more and more uneven. But recently I used the Testor's paint for the first time and found that while it also takes multiple coats to give good coverage, each coat goes on very evenly. Also, note how well the Testor's covered the plastic, which was a piece of a plastic water bottle. 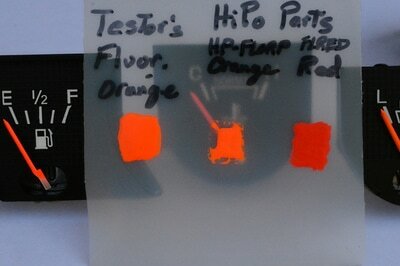 Neither of the HiPo paints covered it very well, and the orange didn't adhere well at all. However, I'm not sure that is relevant. Photography: A problem that bothered me in this quest was getting representative pictures. Photography of specific colors is difficult at best, but when you through in the fluorescent aspect of these paints the problems multiply. My first attempt in photographing these gauges was done under fluorescent lighting and using my old Nikon 990, and the results were very poor. Turns out the lighting was the main culprit, although the camera wasn't the best. So, I turned to my Nikon D7100 DSLR, put the white balance in Direct Sunlight mode, and took everything outside. Given that I should have gotten accurate pictures. However, that is only 1/2 of the equation. Each of you viewing this page is doing so via a display device that will be different from the next person's display, and I have no way of controlling how you have it set up. Given that you should not assume that what you are seeing on your screen is what I see in real life. In fact, what I see on this computer isn't exactly what I see in real life. So, one would think that if we compare the color of the paint swatches to the color of the needles and pick the paint that appears to be the same we'd be home free. However, it doesn't work that way. As I said above, in real life the Testor's paint is the best match for the NOS needles, but on my screen here the HiPo Orange is closer. So, you'll just have to trust me.